Since the new Ramee Mall is walkable from my wellness clinic, there are times my colleagues and me take a walk for lunch and more often than not follow it up with desserts. It gives us a break from Subway and Quiznos which is our usual lunch and breaks the monotony. While the food court is certainly not the best in town (and neither is the mall), but two dessert outlets did catch my attention. In the food court, there is this small waffle stall, called Woops or something like that. 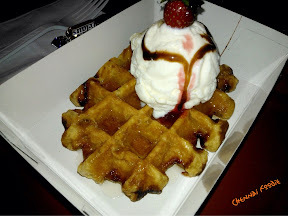 They serve Belgian waffles (ok, shaped like Belgian Waffles), but pretty decent ones with a huge variety of toppings. Sadly they don't have either maple syrup or whipped cream, I think whipped cream makes a star appearance on weekends, but their caramel topping is first class. We usually have caramel topping with dusted sugar, bananas and vanilla ice cream and more often than not, we go back for a second waffle. The waffles are really small and really pricy, but they are tasty. At Rs. 160 for a waffle with toppings, we use them as indulgences once in a while. Another outlet that caught our attention is the Venezia cold stone ice creams. I am not a fan of Cream and Fudge or any vanilla based ice creams that are usually found on these cold stone places, but this place, while not the best in the world, is certainly worthy of a visit. Priced reasonably at about Rs. 80 for a single scoop mix and about Rs. 150 for a two flavor mixes, the ice creams are good. 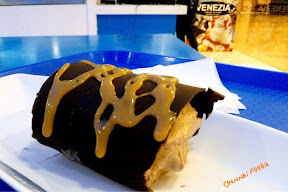 They have this ice cream sandwich which is really nothing but a thin layer of chocolate stuffed with ice cream mix. I liked the Swiss cake mix, which has some shortcakes, chocolate ice creams and nuts, and we ask them to fold it into the sandwich. Both of them are worthy of a try. Ramee mall is the mall next to the Hyatt Regency on Mount Road and the food court is on the second floor, while the Venezia is found next to the food court.